With over 4 million articles, Wikipedia is an invaluable resource, whether you're throwing a term paper together at the last minute, or researching Mohawk Airlines' history for your Mad Men fanfic. But follow enough links, and you get sucked into some seriously strange places. We explore some of Wikipedia's oddities in our 4,264,347-week series, Wiki Wormhole. What It’s About: Only four states—Maine, West Virginia, Kentucky, and Vermont—were sections of other states that went solo. But 38 of the 50 have faced proposals to split them up. Some of these are Civil War-related, as parts of the Confederate states didn’t want to join the Confederacy (West Virginia was the only breakaway state that succeeded in remaining in the Union), and a few sections of the North wanted to leave. Many of the rest are counties, or even individual towns, that don’t want to be part of their state for one reason or another. Strangest Fact: When the Civil War broke out, Town Line, NY, a hamlet well outside of Buffalo, voted to join the Confederacy, going so far as to send troops to fight for the South. While the Confederacy never officially acknowledged their northern possession, it wasn't discovered until the 1920s that the town had never officially rejoined the Union, and residents had not been paying taxes since the war ended. It wasn't until 1946 that Town Line finally voted to rejoin the U.S.A. For reasons unexplained by Wikipedia, that vote was overseen by Cesar Romero. Controversy: Loads, as nearly every partition proposal was or is controversial, and the “Talk” page is overloaded with discussion of what should or shouldn’t count. Thing We Were Happiest To Learn: Delaware was originally part of Pennsylvania, as the British wanted every state to have access to the ocean. In the 1770s, the “lower counties” asked the Crown to recognize them as a separate colony. George III acceded, and the new colony’s first act was to declare independence. In your face, your majesty! Thing We Were Unhappiest To Learn: That when Norman Mailer ran for mayor of New York City in 1969, he lost. Mailer's platform involved breaking NYC away from New York State, on the grounds that the city's vast tax revenues were supporting the rest of the state, the same way tax money from the Northeast and West Coast subsidize all those poorer states that hate taxes and people getting handouts from the government. Mailer failed, and NY remained united. 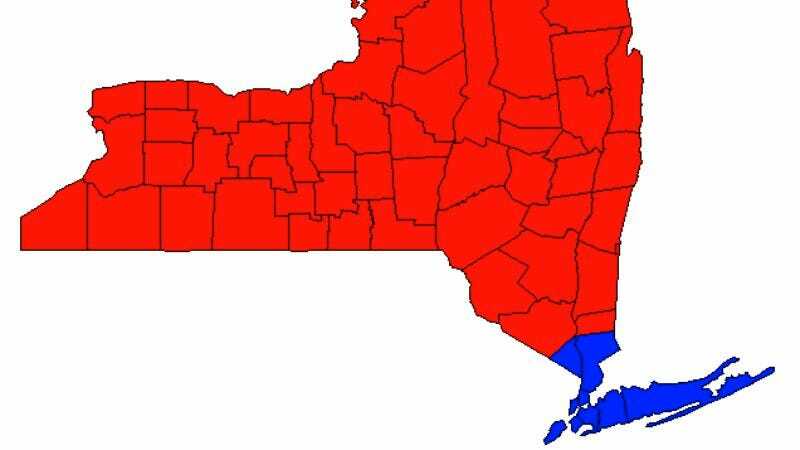 But, apparently, the desire to split is mutual, as Tea Party-affiliated Republicans from the western part of the state floated a proposal 2009 to cut off NYC and Long Island, apparently because they hate money. Before the Constitution gave the U.S. a method for adding new states, many argued that the original 13 colonies should simply continue westward into the lands across the Appalachians, recently won in the Revolutionary War. For some states, the push west was easy—most of Kentucky was originally an extension of Virginia. But for the New England states, hemmed in by the larger Mid-Atlantic states, expansion was tougher. The Connecticut Western Reserve, officially granted by Charles II, but never put into practice, gave the Nutmeg State more lands on the other side of New York and Pennsylvania, in a strip directly west of Connecticut. This not only led to a secession movement by CT’s would-be territory in Ohio (as late as 2005! ), it also led to an actual war between Connecticut and Pennsylvania, which began in the colonial era and continued on until 1799, stopping only for the Revolutionary War. No two states have gone to war since, although you just know North Dakota’s been looking for an excuse to take South Dakota down a peg.